The French Broad River flows for just over 100 miles in the state of North Carolina. The French Broad is free flowing which means that the water level is determined by the amount of rainfall in the watershed. For all sections, particularly the whitewater section, the character of the river changes considerably depending on the water level. A scenic and relaxing stretch of river flows just downstream of Hot Springs toward the TN border. Known locally as Section 10, this stretch begins under the bridge in town and goes 7 miles to Paint Rock. Many floaters choose to take out at the convenient Murray Branch Recreation Area, only 5 miles from town. 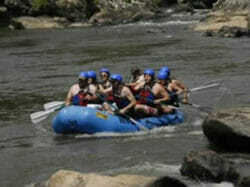 Continue reading for a list of rafting companies renting tubes and inflatable kayaks. For those looking for whitewater, the section of river upstream of Hot Springs, known as Section 9, is the place to go. The rapids range from Class 1 to Class 4 and the scenery is spectacular. There are several outfitters that offer guided raft trips on the whitewater section and they are listed below. Whitewater enthusiasts begin their trip at a place called Barnard, an old drover town along the historic Buncombe Turnpike, now a small community with a county owned park for river access. After launching at Barnard, paddlers have some time to warm up. The river makes a couple of bends before coming to Beginners and The Maze, the first couple of significant rapids. After The Maze, most rafting trips take a break to visit Jump Rock. The jump from the rock into the water is just big enough to be scarier than you thought it would be before you climbed up to the jump spot. After getting your adrenaline going at jump rock you are ready for the bigger rapids that are in the middle of the upper part of Section 9. There are also some good spots to stop for a picnic lunch in that part of the river. After several Class 3 rapids, the river mellows out a bit. Many rafting trips and paddlers elect to take out at a place called Stackhouse. This is another very small community that was once a booming town. Stackhouse is easily recognized by the large Victorian home that was finished in 1903. Those wanting more river time and the chance to paddle a Class 4 rapid will continue past Stackhouse. Between Stackhouse and Hot Springs, the river flows through Pisgah National Forest. For about a mile and a half, the river is very mellow and beautiful with a few smaller rapids. The Laurel River joins the French Broad and you have a view of Needle Rock in the distance. It is not uncommon to see a Bald Eagle in this remote section of river. After this relaxing float comes the big finish with the Class 4 Frank Bell’s rapid. It is a big drop, with a large calm pool at the bottom. From the bottom of Frank Bell’s it is just under a mile to the take out in Hot Springs. Back in Hot Springs enjoy lunch or a cold beverage at one of our many eateries and finish the day off with a soak in the hot mineral springs.